Sample certificate - the real one hasn't come through yet. A new world record has been broken and local fitness chappie, Malcolm Taylor has played an integral part in achieving it. 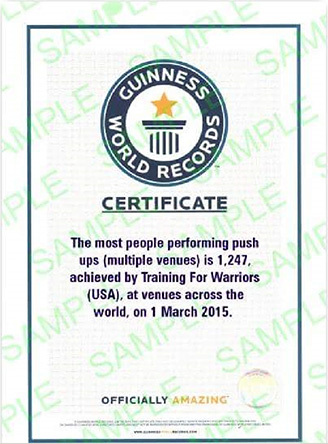 Back in March (Sunday 1st thereof) 1,247 people around the world took part in an attempt to break the record for the most people doing pushups at the same time for one minute. This was an attempt by the international fitness and training organisation: Training For Warriors. Malcolm is the head coach and owner of London branch of TFW which is based in Worcester Park and this was one of the 46 worldwide locations across 29 countries which halped achieve the record total of 1,247 people. The record was only confirmed a few days ago (we still haven't seen the finalised certificate yet) - so congratulations Malcolm and the team. They were all hooked up together by skype and while the UK contingent got to do their pushups at a very civilised 4PM, the Australians were making their efforts at what was 3AM for them. There was also a charitable side to the event. For each pushup done during this frenetic international minute, one pound was donated to the Jay Fund which donates all monies to families with kids who have cancer. From helping with household bills, financial game planning to simply making a child’s life brighter, they are there for parents so they can be there for their child. Malcolm himself managed to do 60 and in total they have raised in excess of $40,000 for the American based charity. For Malcom, this was "personally an even better achievement". The Local (London) branch of TFW meets on Monday, Wednesday and Friday mornings at the Old Malden scout hall (just past the station on the left if you are heading towards the A3). It has morphed over time into a women's fitness, toning and weight loss programme. Malcolm has been training in martial arts since he was 10 years old and has run TFW London for over a year, having run a similar program in Morden for several years before that. If you are interested in joining the program in Worcester Park, please contact Malcolm on by email at tfwlondon@gmail.com or phone him on 07843257749.